The A' Competition for Awards, Prize and Competitions Design is a very special design competition organized by the A' Design Award and Competitions. It is open to submissions of other awards, prizes and competitions only. This award is unique in it is own, only current Awards, Prize and Competitions Design works are accepted, Awards, Prizes and Competitions do not need to be Design Awards, any type of Awards, Prizes and Competitions can be submitted. The A' Design Award for Awards, Prize and Competitions Design is not just an award, it is the indicator of quality and perfection as a Design Competition, the award is recognized worldwide and takes the attention of design oriented companies, professionals and interest groups. Winning the A' Award is a certificate of excellence for designers, an important milestone in your brand. Having the A' Award attracts the eyes of design oriented companies worldwide, winners will be able to find better and higher profile participants, get a step ahead of the competition. Winning awards will be also listed as the "Accredited Awards" at Association of Design and they will be able to use the "Offiically Recognized Award Badge", furthermore an article will be published by DesignPRWire and an editorial will be run by DesignAmid Magazine. 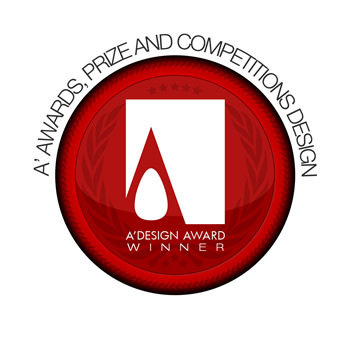 The winners of the A' Awards, Prize and Competitions Design Design Award are provided extensive and exclusive marketing and communication services to promote the success of winning the A' Award. Furthermore, the winning designs appear on the A' best designs book which is available worldwide, this book is furthermore distributed to the high-profile magazine editors, design oriented companies and relevant parties. The winning designs are also exhibited at our museum, and the best designs will be picked for the permanent exhibition. The winners appear on magazines, newspapers, webzines and many other publishing mediums. The Aim of the Awards, Prizes and Competitions Design Award is to attract the attention of media and design editors to your business by means of creating publicity and dissemination and also to seperate you from the rest of the actors in the event organization industry by honoring your institution with a prestigious award. The Awards, Prizes and Competitions Design Award, different from other design award categories considers your event on all aspects. We are expecting you to present us a pdf-brouchure of your event, a representative image of your offering (poster of conference, symposium flyer, convention brochure etc) and a video advertisement of your event or happening if available. You Design Award will be checked for 200 key points under 18 main categories: Evaluation, Main details, Dates & timeline, Fees & costs, Submission requirements & details, Jury details, Secondary details, Organizer & sponsors, Publishing and award ceremony, Contact details, Winners obligations, Certificates and trophies, Eligibility conditions, Results, Awards and prizes, Designers' rights, Press release, Design brief etc. Most important criteria are the transparency, ethics, fairness, code of conduct and methodology. For other type of awards and prizes, specifc controls will follow. We will make a shadow submission to your award or prizes, which will be used to further evaluate the event. A' Design Award offers a distinguished designer program that rewards the award winning designers in 4 tiers. Winners of this award are also expected to provide the following minimım discounts to distinguished program members based on their tier. In return we will also list your institution in the distinguished program page. Alternative to discounts you could offer additional services as well. To be eligible for this award, you should be a representative / manager or owner of an enterprise or business in Event Organization sectors. Only a single entry is allowed in each category every year. Award winners will be able to use a title that matches their nomination category: Such as "Prize Design Award Winner". Main Image* 3600 x 3600 pixels JPEG A Poster or Flyer of your design award or the award trophy, medal or certificate. Optional Image #1 1800 x 1800 pixels JPEG A Poster or Flyer of your design award or the award trophy, medal or certificate. Optional Image #2 1800 x 1800 pixels JPEG Exhibition poster or Winners' Images composition. Optional Image #3 1800 x 1800 pixels JPEG Photo from the Exhibition, Awards Ceremony, Gala Night or During Judging Process or Winners Book Image. Optional Image #4 1800 x 1800 pixels JPEG Photo from the Exhibition, Awards Ceremony, Gala Night or During Judging Process or Winners Book Image. or A composition of images that shows the interface to join the award (for example the website) or paper documents. Documentation Max. 40 x A4 Pages PDF A PDF Document that includes: 1. Website address if available. 2. Rules and Regulation Details (Call for submissions flyer and data) 3. Excerpt from the Winners' book of last year, or Corporate Presentation and details of your award. Video File Max. 10 MB. 45 Sec. AVI A Video Presentation of Your Award.